A versatile meter for audio signals with high resolution (80 stages), high sensitivity (full level from 19 mVeff upwards), very small power consumption during operation (roughly 10 mA) and a broad range of uses. This device measures audio signals and displays their level either in logarithmic or linear manner as lighted band on an LCD in lines 3 (left channel) and 4 (right channel). The maximum level is held for a preselected time and is separately displayed. Per second roughly four measure and display cycles are performed so that the device is suited to display fast changing levels of audio signals. the selection of the ADC reference voltage either derived from the operating voltage (which is at 5 V because of the applied LCD) or from a built-in constant voltage source of 1.1 V. This increases sensitivity by roughly 4.
several ADC input lines can be configured as differential amplifiers, which work in front of the AD converter. With that the medium voltage of the AF signal can be subtracted from the audio signal's level without having to determine that separately. This eases the software substantially. the differential amplifiers can be configured with a gain of either 1 or 20. With that the sensitivity can be increased with a factor of 20. External amplifiers for small signals are not necessary in most applications. Other AVRs, escpecially those with an older design, such as the ATmega8(A) or ATmega328(Px), do not offer those opportunities as they have single-ended AD input only. Other types, such as the ATmega128A or ATtiny261A, offer different gains (10, 100) and the encoding of those two-ended inputs are different. Therefore the transfer of the software provided here to other AVR types has to be handled with some care. To measure AC with an Analog/Digital Converter its medium level has to be increased, so that the whole input signal is zero or positive. This can be achieved by modulating a voltage divider with the AC signal, separated by an electrolytic capacitor. This capacitor separates the DC from the AC input signal. The voltage divider with two identical 10 kΩ resistors divides the operating voltage of 5 V by two. The electrolytic capacitor of 47 µF smoothes this voltage so that the input signal has no influence on this voltage. In this way the AC signal is increased by 2.5 V.
This increased signal voltage is fed, together with the medium voltage to a differential amplifier (which is part of the ATtiny24). This subtracts the medium voltage from the increased signal voltage and feeds the difference to the ADC. The difference is negative for those parts that are negative in the input signal. The ADC can either handle negative voltages, if so configured, or it yields 0 as result, which is chosen here. With that, the ADC delivers values between 0 and 511, with the reference voltage at 5 V.
With an ADC the input signal (here: 1,000 Hz) that can be measured correct has to in between 0 V and the reference voltage (blue curve, Vpp = Uref). The differential amplifier in the ADC subtracts the medium voltage, if so configured. If the negative input, in our case AIN3, is set to half the reference voltage (= Uref / 2 = 0.55 resp. 2.5 V), the ADC measures positive half waves only. The ADC can be configured to also measure negative voltages, but this is not used here. Instead the results of the measurements are multiplied by 2, so that this is compensated. The red line (2*Average) reflects this. In our case every 13,13 µs the AD measures that signal (ADC-Sense, black points). With the maximum measurable AC signal applied, the average is 362 (of the 1023 maximum that the ADC can measure). The measured average value has to be converted to the number of columns that are either fully or partially lighted on the LCD. This conversion can be done in a linear or logarithmic form. The software decides that based on a parameter that is defined within the head of the source code file. The lin curve is more mathmatically oriented while the log curve is nearer to our own ear and sound impression. This diagram shows the dynamic range in dBu that is covered when logarithmic conversion is chosen. dBu is defined as dBu = 20 * lg (Ueff / 0,755). The gain of the differential amplifier (G) varies between 1 and 20, the selected reference voltage between 1.1 and 5 V. This large range should satisfy most needs and tastes. If the linear conversion is selected the dynamic range is from 0,2 mVeff up to 2 Veff. This also offers a wide opportunity for needs and tastes. The subtracted medium voltage has to be exact half the reference voltage, which is not exactly the case when simply using a voltage divider with two 5% resistors. To get more exact results one should measure the exact reference voltage (on the AREF pin) and apply half of that to the AIN3 pin (e.g. with a ten turn adjustable resistor). The real gain of the differential amplifiers has to be measured to get more exact results. The offset of the differential amplifier should be measured and the measured results used to correct the ADC result. Corrections to the gain require a 16-by-16-bit multiplication. For most of the practical applications this increase in accuracy is unnecessary, so it was not implemented here. The used LCD has 20 characters per line. To increase the display's resolution the self-defined characters 0 to 3 are used. In the example here the display of the levels 40 to 44 is shown. To adjust AF levels a maximum display is necessary. This should cover a longer period of signal strength measurements to be readable. In our case the measured levels for 14 cycle periods are stored, which causes a delay of roughly 3 seconds. The display of this maximum uses the self-designed characters 4 to 7 of the LCD. The picture shows, for a signal level of 44 units, the maximum at 52 to 55. The characters 0 to 7 were designed with the tool provided here. This is the electronic scheme of the device. 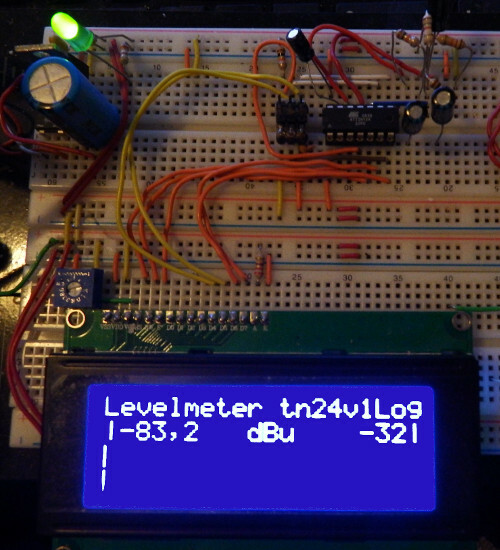 The measuring is performed by the ATtiny24, the display is done with a 4 line and 20 character wide LCD. The analog input signal is coupled in over a 1 µF electrolytic capacitor to the AD inputs AIN1 (left channel) and AIN2 (right channel). The voltage divider 12k/1.5k provides the medium voltage for the reference voltage of 1.1 V, which is coupled via a 10k resistor to both AD inputs and connected to AIN3. A 47 µF electrolytical capacitor holds this medium voltage free of AC. The reference voltage of 1.1 V is generated internally and blocked with a capacitor of 100 nF on the AREF pin. The control pins RS, R/W and E of the LCD are attached to the port pins PB0, PB1 and PB2. The upper four data bus bits of the LCD are attached to the upper four port pins of port A. Communication on this bus is bidirectional, R/W determines the direction. The LCD backlight is driven by the current limiting resistor of 220 Ω, which provides a small current of 7.7 mA. 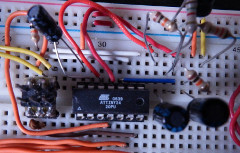 To program the ATtiny24 within the target a six pin ISP plug is integrated. This provides the signals MOSI, MISO, SCK and RESET for programming. MOSI, MISO and SCK are also used for the LCD data bus. This does not conflict because the data bus is not driven by the LCD during programming. When programming the ATtiny24 the operating voltage can be selected as reference voltage of the LCD. In this case the medium voltage has to be adjusted to 2.5 V. This is done with the two resistors of 10 kΩ. With that the full signal amplitude of 5 Vpp = 1,77 Veff is covered. Other components do not change. This is the controller section of the mountings on a breadboard. This is the mounting including the LCD and the 5 V supply part. The software is in assembler and requires the following adjustments prior to assembling. cAdc_1p1 = 1 selects the internal voltage reference. cAdcGain = 20 selects the gain of the differential amplifier. cLog gibt an, dass die Anzeige logarithmisch erfolgen soll. cMaxHold = 14 selects the number of hold cycles for the maximum calculation. A cyce is 0.217 s long, 14 corresponds to 3 seconds. Other parameters can be selected by editing the source file. All constants are checked prior to assembling, false entries lead to error messages of the assembler. The assembler used has to be able to process the directives .IF, .ELSE, .ENDIF und .ERROR "message". ATMEL's Assembler2 and gavrasm are able to assemble that. 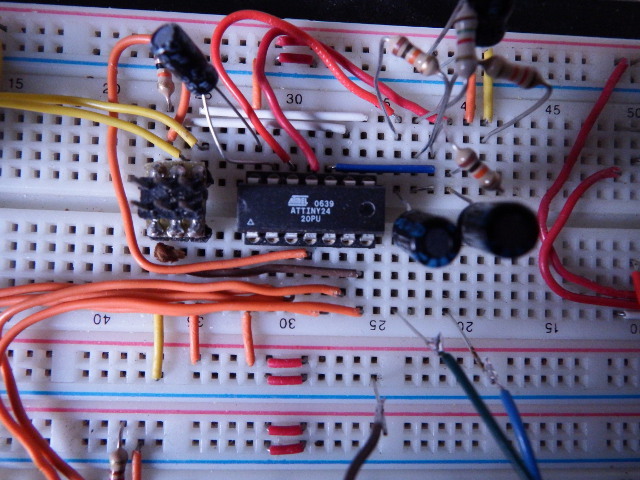 The clock of the ATtiny24 is adjusted to 4 MHz by writing to the CLKPR port. The default clock of 1 MHz is overwritten with that, no fuses have to be changed. Measuring is performed interrupt-driven with the ADC_RDY vector, the controller is in the SLEEP mode idle. The service routine measures the difference voltage on pins AIN1 and AIN2 one after the other. The values are summed up in a 24 bit wide register, per channel. If 8,192 measurements per channel have been performed, the T flag in SREG is set and the calculation/display routine is executed. There, the sums are divided by 4,096 (256 by ignoring the lowest byte, by 16 through repeated LSR and ROR) and rounded. By comparing the result with 80 defined levels in a flash table the number of fully and partially filled characters is calculated. Fully filled characters are defined by the LCD routine as 0, partially ones as 1 to 3. To calculate the maximum level the resulting level of 0 to 79 is written to a buffer after this buffer has been shifted upward by one position. The buffer length controls the time over which the maximum is held. From that buffer the maximum is calculated and converted to the number of columns and to the displayed maximum character 4, 5, 6 or 7. If the position where the maximum is to be located is already occupied, the next higher column is selected and the character 4 is displayed. This is done for both channels (left and right) separately, the result is assembled in a 2*20 character buffer in SRAM. These two buffers finally are displayed in the lines 3 and 4 of the LCD. The software is written in assembler and is available here. To assemble the source code the LCD include file is required. Place both files into the same directory so that the include file is found. The devive works fine. The measured mV levels are differing from what was measured with a voltmeter. The difference is mainly caused by the unadjusted medium voltage. In most applications the difference is insignificant. This is a typical display with an audio signal on the right channel input. Music levels can be displayed in a acceptable manner, as the video shows (download the MPG version with sound, if your browser does not display the video or if it has no sound). Your browser cannot display this video. You can download this video at this address, store it locally and display it with your own favoured videoplayer.